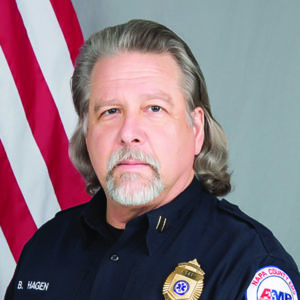 Over Bruce Hagen’s distinguished 35-year career in EMS he has earned countless certifications, including mountain and wilderness rescue. This depth of experience, coupled with his leadership and clinical skills, are exactly the traits needed in an individual tasked with coordinating an EMS response during one of the nation’s worst firestorms. At about 9:30 p.m. on October 8, 2017, calls came in over 911 Fire/EMS dispatch channels reporting one or more spot fires in the hills above the City of Napa. After contacting the CAL Fire Incident Commander (IC), Bruce, the Field Supervisor on duty at the time and already half way through his shift, assumed the role of radio liaison to manage EMS radio communications between the PSAP (dispatch center) and the Fire IC. A report then came in that up to 45 people were trapped in homes along Atlas Peak Road and could not evacuate. With no fire resources available, Bruce requested the help of the CHP H32 helicopter to assist the AMR Operations Manager and multiple AMR ALS ambulance units with the rescue evacuations. The AMR crews, along with Sheriff’s Deputies, then went door to door to evacuate residents. As the fire progressed, Bruce and the Fire IC became surrounded by fire, and were forced to evacuate themselves. As Bruce was pulling out of a parking lot, he observed a woman running to flee the area. The woman was struck by a wind-blown road sign that knocked her to the ground. Bruce placed the woman in the back of his supervisor vehicle then drove her to safety. Bruce continued to work, without a break, until about 3:00 p.m. when he was relieved by another supervisor. After a short rest period, Bruce returned to work and completed additional shifts during the response phase of the disaster, which lasted for two weeks. Bruce worked with fire agencies at a field command post and staging areas, and directed incoming EMS resources, including mutual aid strike teams, to various assignments.